The ultimate companion for the traveler in Israel. Buy now & make your visit in Israel complete. 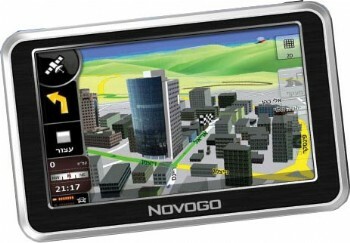 The Novogo I905 is built on the Windows Mobile Platform and uses the Mio Map navigation software. The Novogo I905 is a dedicated GPS unit that doesn’t have traditional Personal Digital Assistant (PDA) functions. Windows Mobile is hidden at all times to the user. Obviously, this means that you don’t use all the bits of the devices but on the other hand it makes it easier to use for the low-tech person. The Novogo I905 is based on a 5 inch widescreen. The new screen size makes this new device easier to use than ever and provides a widescreen view of the world. Larger icons and a brighter display with a user-friendly touch screen make it easier to set your destination. 1, 2, Go! Maps of Israel are pre-loaded and ready to use out of the box.+Clear voice instructions provide guidance and user-friendly menus are available in your choice of 22 languages, including English, Hebrew, French and Spanish.